"Very Good, but I think the author forgot to add some milk. 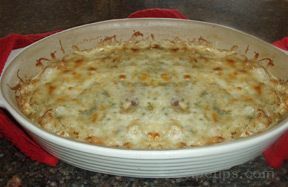 I added 1/2 cup of ... read full review"
Mix altogether except for 1/2 cup cracker crumbs in large baking dish. Top with 1/2 cup cracker crumbs. Bake at 375 degrees for 45 minutes or until vegetables are tender. "Very Good, but I think the author forgot to add some milk. I added 1/2 cup of half and half and 1/2 cup of water. I added it before it went into the oven, Just adding the soup was too thick. it also needed to cook for at least 60 minutes if using fresh vegetables. Also put 1 cup of crackers in the mixture and put Panko on top."